Bobmo's Blog: Who is Really Fair and Balanced? 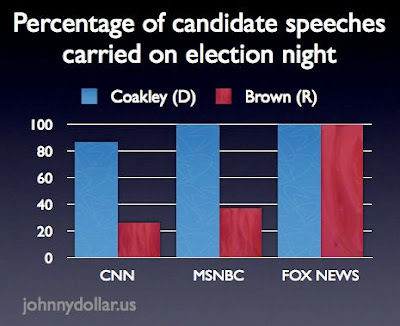 This chart from johnny dollar's place shows the percentage of the Massachusetts Senate candidates' speeches which were aired by CNN, MSNBC, and Fox News on the night of the election. Fortunately the voters still voted for Brown. It's rather simple to find evidence for exactly the opposite conclusion. Are you saying that you could easily find evidence that CNN and MSNBC are conservatively biased and Fox is liberally biased? OK, just kidding. I think television programming overall is far more liberally biased than conservatively biased. Fox is a notable exception. Typically, where the subject matter is primarily chosen by the listening audience, e.g. talk radio, there tends to be a conservative slant. And where the audience is somewhat more disconnected from the day-to-day programming decisions, e.g. television programming, there tends to be a more liberal slant. Fox is a notable exception, and their ratings show it. During the Massachusetts special election coverage, O'Reilly reports that Fox had almost 6 times the viewers of MSNBC and 5 times the viewers of CNN. He said his program beat all of ABC's prime time programming that evening. I think more and more viewers are concluding that Fox provides more balanced coverage (and stories you won't hear from the MSM, e.g. Acorn expose) than any other television network. As long as the government doesn't interfere, I believe that private broadcasters should be free to air whatever news stories they like as long as the don't misrepresent the facts of the story in question. I would go farther than that. I don't think the government should police those who misrepresent the facts. My post was simply obvserving what is, not what should be.